1. Heat the oil in a large pan, add the onions, carrots and garlic, sauté for 4mins, until they are beginning to soften but not colour. Stir in the ground coriander and plenty of seasoning and cook for 1min. 2. Add the stock and bring to the boil, cover and simmer for 20mins or until the carrots are really tender. Stir in the fresh coriander. 3. 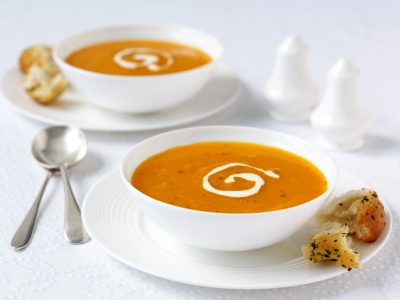 Whizz the soup with a stick blender or transfer to a food processor. Add the lemon juice and nutmeg to taste and adjust the seasoning as necessary. Reheat until just hot but not boiling and serve. Garnish with a swirl of cream if liked.